Backed by our expertise in the domain, we offer our valued clients Disposable Urine Bag. Disposable Urine Bag is made using flexible and ultra-soft PVC film. Disposable Urine Bag has non return valve to prevent back flow of urine. Disposable Urine Bag is completely sterilized, thus, ready to use. 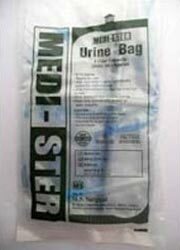 We offer Disposable Urine Bag in different capacities such as 2000 Ml and others. Carton Packing : 10 pieces in an inner box, 500 pieces in a carton.